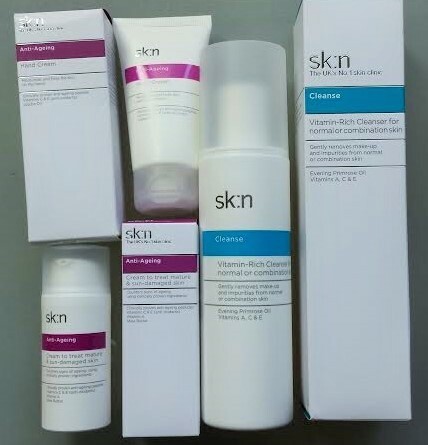 I’ve often walked past the Sk:n clinic in London’s Victoria Street but until recently I didn’t know that they make their own range of skin care products. I discovered they have a broad range of products covering anti-ageing, anti-blemish, cleanse and exfoliate, corrective, protect, repair, sensitive skin and even make-up. I was intrigued to try out their products and selected three to try – Vitamin-Rich Cleanser from the Cleanse range, and Cream to Treat Mature & Sun-Damaged Skin and Hand Cream from the Anti-Ageing range. Starting with the Vitamin-Rich Cleanser (normal/combination), as that is the first part of my routine, I had a bit of a fight with opening the container. The cap doesn’t twist off or unscrew but needs a bit of a hefty pull to remove and as much strength to replace. I was then expecting a pump action to dispense the cream but no – you need to press down on the top to open up an aperture and then squeeze the bottle to get at the cleanser. Anyway, I squeezed out the cleanser onto a damp cloth and used it as a hot-cloth cleanser. It’s recommended to use it with cotton wool pads but I prefer to use it this way to feel really fresh and clean. I found it left my skin feeling really clean but not stripped of moisture and as it says it was ready to add further skincare products. It costs £16.75 for 200ml here. So now I was ready to try the Cream to Treat Mature & Sun-Damaged Skin (I apply a serum, oil or essence normally at this stage before my moisturising layer for an extra boost). This cream is way easier to handle and comes with a pump to dispense just the right amount of a rich but readily absorbed cream with a luxury feel. It’s not at all greasy or shiny so makes a great base for make-up. Having used this product morning and night over the last couple of weeks I’ve found it’s really given my skin a firmness and made it feel velvety to the touch. Definitely an asset to my skincare collection. It costs £33.75 here for 30ml. Final product from my newly discovered brand is the Hand Cream. It’s great to have a handy size tube of hand cream to pop in my bag for work. This fits the bill on size as well as being specifically anti-ageing which is a must to protect the skin in the very place where ageing seems to show first. I’ve found that this rich cream is quick to ease any dryness and sinks in quickly to protect. I have to say though that I haven’t found it to have a lasting effect on counteracting dry skin on my hands but I do tend to use a lot of anti-bac gel which is drying and I do expect that over a longer period of use that I might get better results. A 50ml tube cost £15.75 here. So overall, I’ve been pleasantly surprised by my new brand discovery. Have you tried any Sk:n products or been to any of their clinics? I’d love to hear about any treatments you’ve had.